Made it!! And Buzz was there to help me celebrate! Gentle readers, today was a red letter day for me. 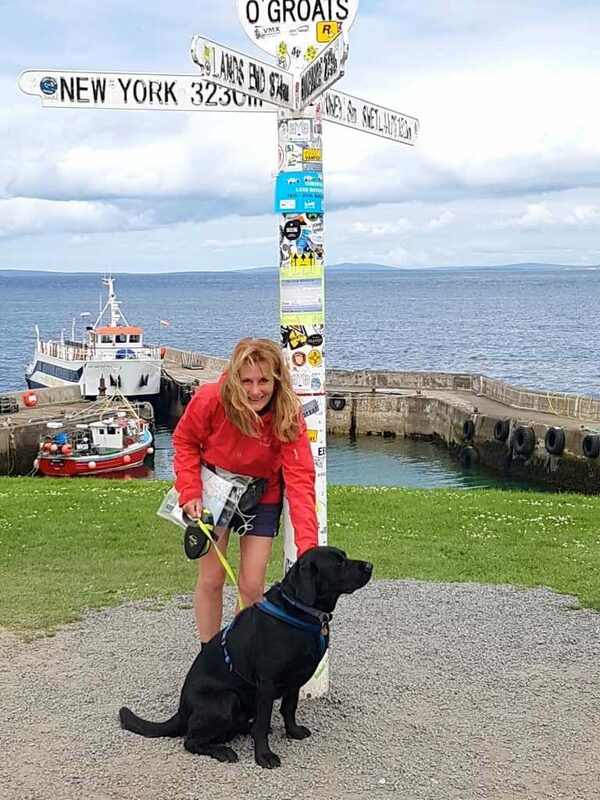 I made it to John o’Groats after 91 days of walking from Land’s End. My joy is immense. I can’t tell you how much I have appreciated your support throughout the journey .. but I will make an attempt in a longer blog in a few days. But for now .. there’s a deep bath, a special bottle of champagne and some very dear friends with whom to share it. The same friends who surprised me at the famous finger post. And then there will be lots and lots of sleep .. Many congratulations Jules, an amazing achievement. Our paths crossed in the Yorkshire dales,and I’ve been following your progress ever since. Enjoy a well deserved rest, and a cold bottle of champers. Congratulations, I’ve so enjoyed your adventure. I’ll add a little to SANE in honour of your walk. Fantastic achievement – you will always be proud of this, and can always remember that you were able to dig deep and carry on and see this to the end even when at times your body, and sometimes your mind, did not want you to. So, so glad you have company again at the end…again Patrick had told me this was the undisclosed plan. I have no doubt that you will celebrate tonight as best as you are able – not sure from the images I saw what JOG has to offer in terms of fine dining – and then I hope there are many more months of people spoiling you and celebrating your walk. Well done to you Jules! Thank you so much, Tony .. it was terrific getting your messages along the way, particularly when taxi temptation reared its ugly head!! It was wonderful seeing you and Jill the other evening. Thank you for your very kind words. Make sure you look after those puppies! Congratulations to you for such an amazing achievement ! You’re legs will enjoy the rest no doubt! Loved your pictures you drew along the way. Congratulations Jules. Pete and I have both enjoyed your blog so much. You are amazing. Congratulations Jules! What an amazing achievement! What a wonderful adventurous and interesting but also strenuous Journey. Thanks for sharing your experience with all its highs and lows. Have a good lie in and we look forwards to reading the final blog. Thank you, Silvia. Please make sure you come and see us if your journeys take you through Sydney in the future. We’d love to see you and Doug. Anna, great getting your messages .. looking forward to seeing you back in Sydney. Congratulations Jules!! You must be so happy and proud, just as we all are of you. I hope it has been worth the pain and tiredness and effort. Certainly for those following you closely on the blog we feel it worthwhile as you are an inspiration to us all. Not only have you completed this huge feat but you have helped spread awareness of mental health issues and shown with determination and the strength of those around you willing you on that so much can be accomplished. Rest well, relish and rejoice in your success and know you are well admired for all you have accomplished. What a huge achievement…We will raise a glass or three to your bravery and tenacity Jules – I am in awe! Such an amazing achievement. Enjoy your pampering. Thanks so much, Tiana. Lovely to get your comment. Yeah – amazing – so wonderful- congratulations- and enjoy the champagne, bath and bed!! This has been the singularly most impressive feat on a number of levels, from anyone I have known in my lifetime. Congratulations, congratulations, congratulations! Mark .. what can I say to that, except wow. I’m blown away by your kind and generous words and truly do feel humbled by them. Thank you so much. And thank you too for letting me share the most wonderful time with your wife. She is the best of friends. Soooo proud of you! Congratulations!!!!!! A red letter day indeed dearest Jules! Your journey is completed and you can reflect on the select club you have now joined. YOUR LONG WAY IS A BEAUTIFUL LIFE’S LESSON. I M VERY HAPPY FOR YOU ,FOR YOUR FAMILY,FOR YOUR FRIENDS. Congratulations again. Very well done. A great achievement that you will always cherish. It has been a great pleasure to follow you. 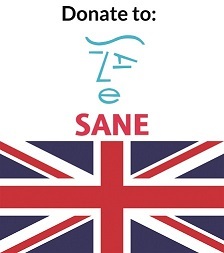 I have made a donation to SANE. Dear Conrad, it was such a delight having your company all along the way. You were a constant companion and a great encouragement to me. My thanks too for your wonderful donation, gentle reader .. and now I have your website to look forward to enjoying. Shedding tears of joy for you too Jules. Congratulations!!!! Enjoy the rest. This morning the first thing I said to Ella (the boys are away on a two day rural golf tour) was – ‘Jules will have finished!! !’ and then here you are shimmering out at me with your black dog friend. Have to admit to some tears of joy mixed with sadness and sweetness. Incredible determination Jules including these last few days – how proud we are to know someone of your calibre. Thank you for walking for all of us. And I too will sorely miss the wonderful blog in all its silliness (the highland cow impersonation is my favourite), its history and deep honesty. Can’t wait to cheers you back in Oz. Absolutely amazing. Congratulations on such a wonderful achievement. Life won’t be quite the same without your daily blog. What’s the next project??!! Congratulations, Jules – what an achievement! I have truly enjoyed the updates of your journey over the past three months and will now have to resort to the ‘traditional news’ again which tend to be less inspiring. If you ever consider converting your memories into a book, I’d like to pre-order one already. You and Moni have been such wonderful supporters, Bernd. Thank you so much. Looking forward to seeing you both soon! Thank you so much, Manju and Brijesh. Great getting your messages. Brilliant, brilliant, brilliant! Huge achievement. And a black dog at the finishing post to give you a cuddle! It has just occurred to me that I will have nothing to read each morning now. Can you go back the other way now, please? If only! Think my family would disown me if I were to do that ..
Too late now!! But NZ is another story! A huge congratulations to you! What an amazing achievement, you are such an inspiration! Thank you for the most wonderful writing, I have followed your journey and have loved every minute of it. Congratulations what an achievement We have so enjoyed your blog and the photographs have been wonderful. We are sure your Dad was with you all the way. I must say, I thought of him often as I was walking .. noticing all the things he would have enjoyed and remarked on. It was a wonderful way to remember all the good times. 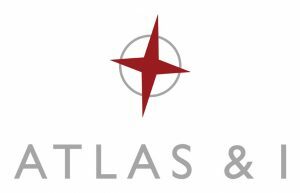 Thanks for following the blog and for your comment. Great to get it. Congratulations. From snowy LE to JOG, you are now an end to ender. You did it! Yay! I hope you’re having just as much fun as me, Helen. I just tried to look at your blog but had trouble opening the page .. hope all’s ok. Thanks so much for your messages. Well done Jules, brilliant effort and it’s hard to believe that it’s over already. It was great reading your blogs and feeling like we were part of it in a way. Enjoy the feeling, rest easy and look forward to speaking to you soon. Thanks Marak, great knowing that you and Penny were reading the blog and at my side throughout. Speak soon, I hope. Congratulations on your HUGE achievement. Lucy Karnani told me about your walk and I have followed you all the way. My husband (he is originally English and I’m an Aussie) and I walked in the opposite direction in 2010 via a different route. We had many similar and some quite different experiences. Your weather in Scotland was amazing and the opposite to ours. The drought broke immediately we started walking!!!! When you have recovered- it takes a while!! – you may like to have a look at keithbadger.com for the book he wrote about the transformation he experienced doing the walk – Joining Loose Ends. 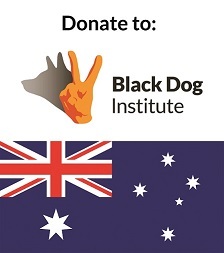 We will contribute to your Black Dog/Sane charities. This achievement will give you a constant inner smile for the rest of your life. Well done, you are an amazing, inspiring, tenacious, courageous woman. AND I KNOW!! Thank you so much, Mark .. your comment means a huge amount to me. I read all of your posts as I was preparing my route and thoroughly enjoyed them as well as finding them massively helpful. You are a star Jules – congratulations! Enjoy your rest and reflect on how much joy you have brought to us all. How brilliant that, , you have achieved everything you set out to do and so much more. You have not only practically done the impossible as far as the walk is concerned but you have raised, without doubt, a significant amount of money for such an vital charity and made so many people think about the suffering depression can cause. Well done Jules – now you need to recover. I do hope you decide to publish a little book in the future as the work is done. It could inspire others. The blogs ( which I shall miss) are so personal and natural that we were all on the journey with you. The illustrations, both the wonderful drawings and the photos, endorsed all those experiences- we shared it all. A donation will follow. See you soon we hope. Thank you Graham .. although not sure when this will get to you on the deepest, darkest, most beautiful of continents! Just got enough signal (i think) in darkest Africa to read of your success. Well done Jules!